Gorgeously Furnished, Remodeled River Hideaway with Hot Tub, Outdoor Great Room for Living and Dining, Gas Fireplace; Walk to Downtown Guerneville, Rio Nido Roadhouse & Swimming Pool, across the street to Stumptown Brewery! Short Drive to Wine Tasting, Coast, Hiking, Golf. WIFI. Keyless Entry. Your Well-Behaved Dog is Welcome! There is a flight of steps up to the entry. 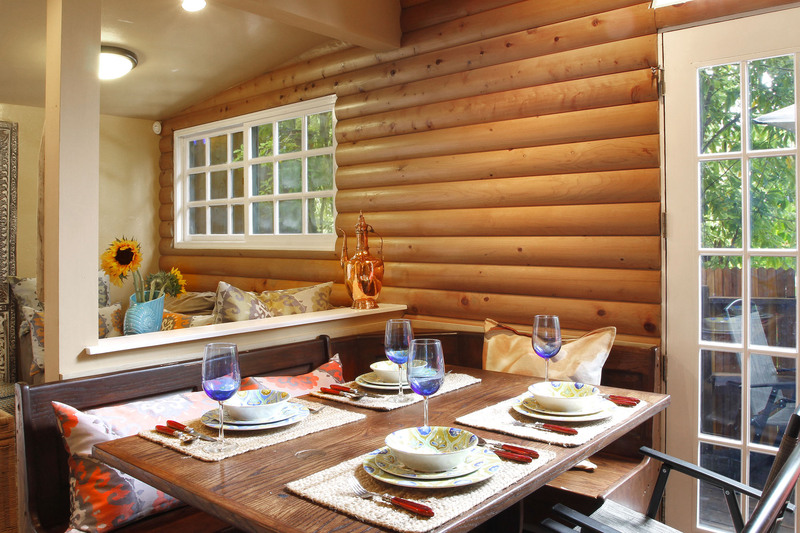 The living room has a seating area and a dining set, opening to a small deck with bistro set. The kitchen is off the living room in an L. The bedroom is off the living room opens to the bathroom. Off the kitchen area, the deck is to the side of the house and has outdoor dining, hot tub, and outdoor living furniture. House is approx. 800sf. Note this home is in a relatively dense river neighborhod on a side road parallel to River Road and across from Stumptown Brewery. 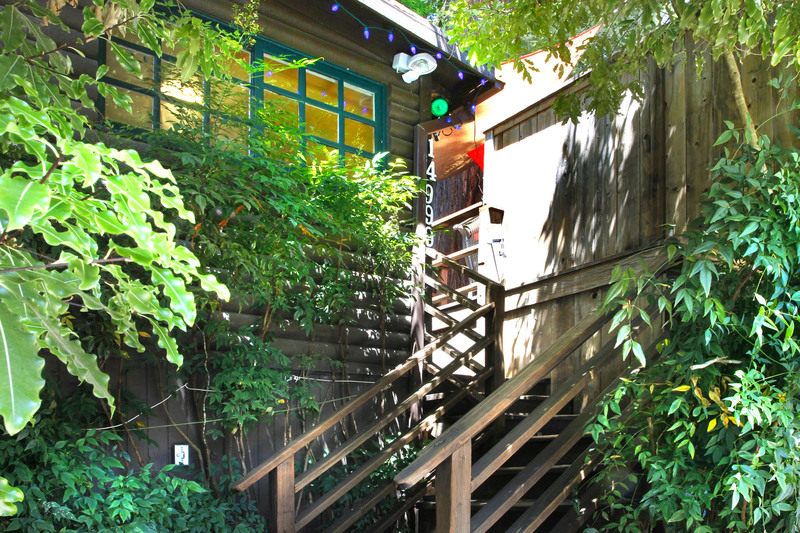 Great little spot with a beautiful private deck and lovely hot tub under the redwoods. The house was not too far to town, and we were able to walk there along a quiet side street. We enjoyed our stay and would return again. This home is absolutely worth it! Can't wait to stay there again! Super cute getaway that’s walking distance to town. Wonderful treehouse feeling retreat in the heart of the Russian River valley! Great location with easy access to Stumptown Brewery! We had a great time! "Beautiful outdoor space with hot tub"
Beautiful outdoor space with hot tub. Location is very close to Stumptown Brewery. Really enjoyed our stay! "Great communication, cute little place"
Great communication, cute little place. Very good location - would most definitely stay again!!! "This place is a great little getaway"
This was a very clean space we loved staying here! Great little house overall. Very clean and had everything we needed to cook! Hot tub was very relaxing after a hike! Only thing I would say is there is no outside light(that we could find) on the porch. So we used a flashlight to grill. Also, the sun shades over the backyard and the hot tub were full of leaves and mud. Just needs a little attention outside :) other than that, cute little house across the street from stump town brewery, close to town and close to the river! What was good was good. The pictures show what is lovely about this place. What was not clear to us and, for us, changes the value proposition here are the following: - this is a duplex which shares a wall (and all sounds) with a neighboring unit - this is just one how in a row of tightly packed homes (and separated only by a 3/4" of aging boards on once side and a shared (sheetrock) wall on the other - this is on a dirt road with equally tighly pack homes on the other and with an average quality mix no in keeping with the quaint/conscious/zen interior at all (eg: a working town for laborer level living/occupants NOT some quiet conscious vacation towns or a home nestled on its own like the "retreat" it is billed AND PRICED at. So if the managers would just bring a balance of this kind of more critical feedback, transparently integrating the "cons" with all the "pros" the advert currently champions, THEN buyers could decide for themselves. Knowing what we know now (and all drama with racing back out because of the wild fires - clearly NOT their fault! ), we'd have never paid that much $$$ for the net value of the accommodations/location. Thank you for the review, David, but at first I thought you had reviewed the wrong house because Serendipity is definitely not a duplex. It also does say in the listing that this home is in a dense neighborhood, which is certainly true. That said, it sounds as though it was not a good match for you, and, for that, I am sorry. 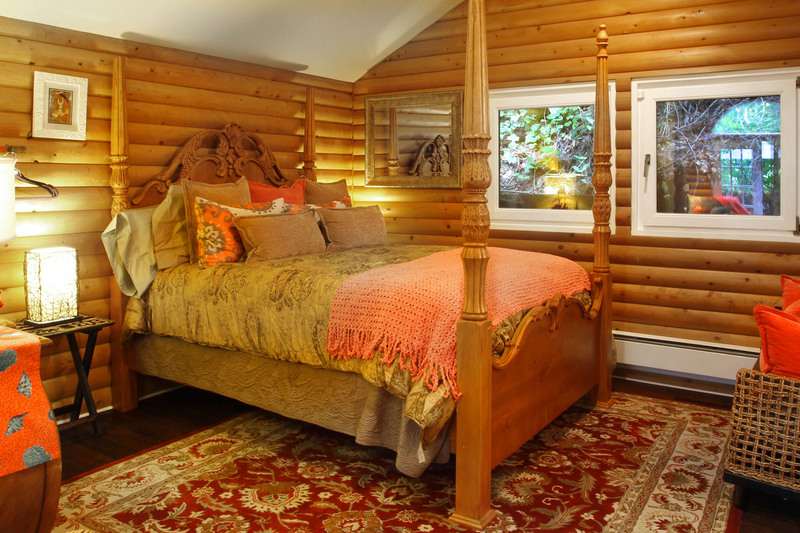 "Very cozy place nestled into the redwoods"
Very cozy place nestled into the redwoods. Walking distance to the river, shops and restaurants. Four adults was a little cramped but we made it work and the hot tub was lovely. We came here on our honeymoon — and it was exactly the quiet, relaxing opportunity to just be by ourselves after a huge party. The house was cozy, well appointed, and secluded. We're looking forward to coming back! We love the town of Guerneville (check out the ice cream shops and oyster bar! ), and in the summer it's great for just floating on the Russian River. "Great place, had a nice weekend relaxing in the woods "
Great place, had a nice weekend relaxing in the woods :) would totally recommend! Thanks Again! The place is very nice and secluded and the hot tub is a great touch for sure. The house is great. Simple and cozy. 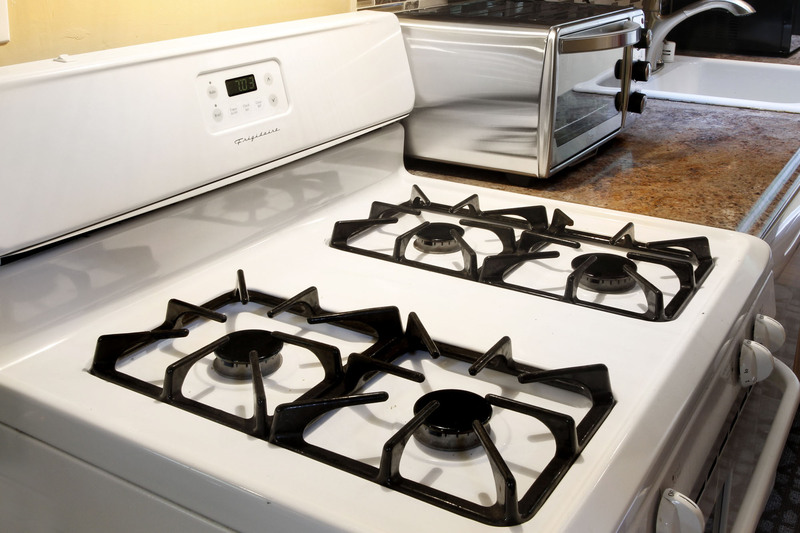 The kitchen is up to date, but not stocked with essentials like cooking and cleaning supplies. The house is in a safe area and easily walkable to town. We loved the hot tub! Thanksfor the great stay. Beautiful spot. 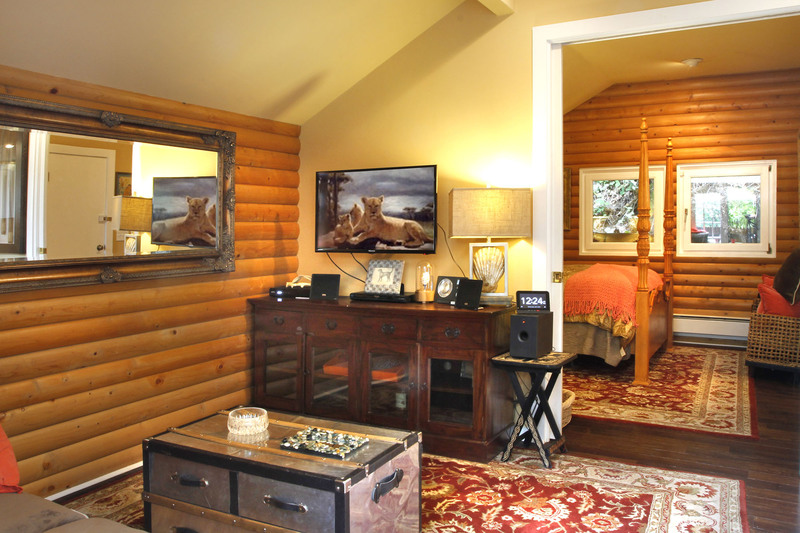 Lovely house...perfect for relaxing and great location to enjoy the Russian River. Will come back for sure! "We loved staying at Serendipity! " We loved staying at Serendipity! Everything was just as we expected. The bed is super comfy, Wi-Fi worked wonderfully, and the hot tub was fantastic. Very convenient to get to town. Really great to have a full kitchen and washer/dryer. We had a small maintenance issue and I was so impressed with the professionalism and speed that this was addressed. We would definitely stay here again! Enjoyed our stay here. This was pretty convenient for us and much better than the Marriott. "just okay. not very impressed." This place looked great in the pics! 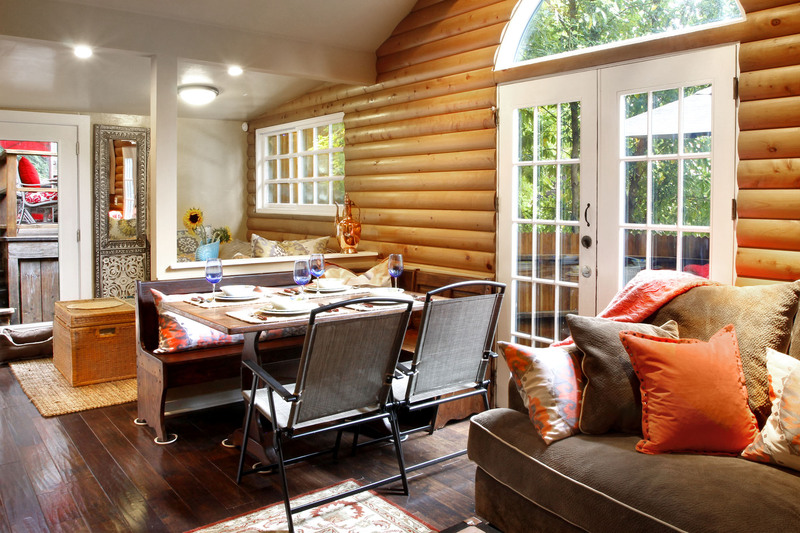 Decor is sweet - a little mismatched/awkwardly arranged but overall a cabin/tree-house feel. The trees through the deck were beautiful! Neighborhood was quiet. Parking was easy. 1) It was 100 degree weather this weekend. Inside the house was close to 90. We absolutely read that there was no A/C so we were a bit concerned BUT we got there and saw a ceiling fan and a swamp cooler! perfect, right? Swamp cooler is good for one room. Looked around for more fans and there were none... totally needed to circulate the air. Opened some windows/doors but shut them pretty quickly since there are no screens (except for the bedroom) and bugs/mosquitos were happily joining our vacay. We couldnt get the ceiling fan to work. No manual. Just a switch and a remote. We tried it all and even bought new batteries. Finally gave up and it magically turned on about 11pm the first night?! Timer? Still don't know. Helped a little. 2) We had bought food to grill. Started around 8ish. Looked for the porch light to continue. No light? Not working? Had to use our phone flashlight to finish cooking dinner that first night. We left a msg with property mngmt that first night. When we returned to the house after our river visit the following day they had left 3 large fans for us. Didn't call us back but did leave fans... seemed little weird but we went with it. 3) Sadly, had to take away 2 stars for this stuff: * The deck had spider webs (you could tell they had been there awhile)... the deck furniture (including the cute cushions) were dirty. * The floors were dusty and there was dog hair here and there. Totally understand it's a dog friendly place (we brought our pup too!) but it seemed as though it hadn't been swept from the previous furry visitor. I rolled up the inside mat by the front porch because we didn't want our dog to further shed all over it and because we brought him his own bed/mat. As I rolled it up... underneath was SUPER dusty with layers of dog hair. So I swept the floor but even the swiffer/sweeper mop was pretty dirty. * The bathtub had some sticky soapy film and the mat was moldy. Also random hairs on the floor mat in the bathroom. I will add that the kitchen/fridge were throughly cleaned. Plenty of dishes and cooking gadgets. Overall, still not sure I'd stay here again and definitely not when it's 75+ degree weather. Highly suggest adding door and window screens and ensuring cleanliness before guests. The rental house is in a beautiful location, nestled in the trees just off River Road. There are in fact three giant redwoods on the property, and the outside decks are built around them nicely. 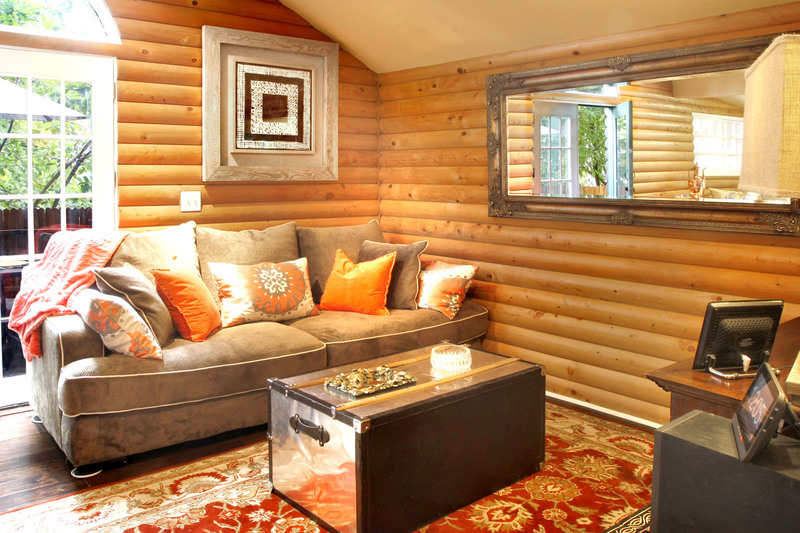 The furnishings are cozy, but there's plenty of room. We liked the built-in bench around the dining table. The in-house laundry is great to have. The bathroom towels all smelled moldy, so being able to wash them was key. There's not a curtain in the place, which is unfortunate if you ever want to shut out the outdoor light. Privacy is mostly not an issue, because greenery blocks any public-facing windows. Our stay was disappointing, because our main reason for choosing the location was the hot tub, and it was not operable, or operating correctly, most of the time. We arrived on Friday, and got in the hot tub. Only low, weak jets would turn on. You could only tell by placing your hand right by the jet. But it was hot, and after business hours, so we settled for that, and resolved to call the next day. However, on Saturday, the tub was working as expected. We enjoyed it in the morning and early afternoon. So we did not call to report any problems. But later that evening, when we returned to the tub, it was completely unresponsive, and the display totally dark. It appeared to have shut down entirely. There was certainly no point in calling anyone on a Saturday night. We hoped we might get another chance to soak on Sunday morning before we had to check out, but it remained off until we left. It's a lovely place, but we'll look elsewhere for our next trip to Guerneville. We're so sorry about the hot tub Morgan! 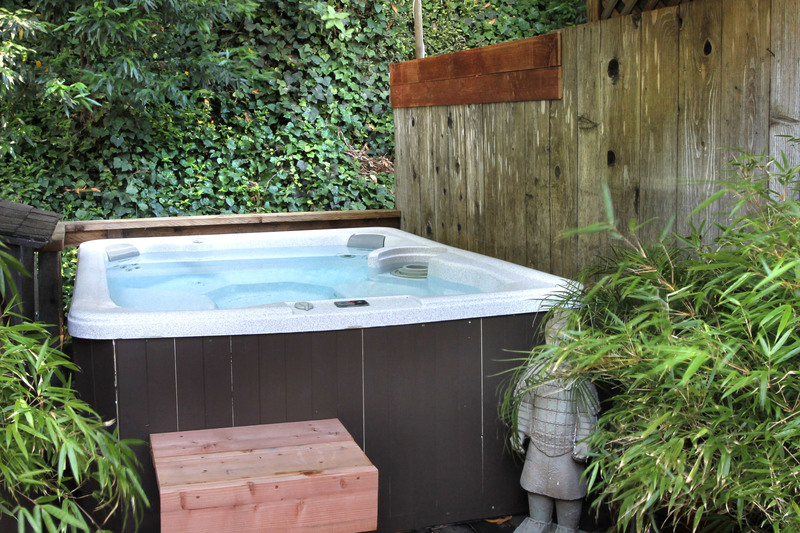 Our hot tub folks will gladly come out on weekends and after hours, so please, next time, make the call right away! "Serendipity was perfect for our little family"
Serendipity was perfect for our little family. Our 2-year-old loved the big redwoods outside and the banana slug we found in the garage. My husband and I loved that it was quiet, cozy, clean and close to everything we wanted to do. We would definitely stay there again! Communication was clear and consistent - I received many emails with the check info. The place was easy to find. It had been raining like crazy so the road was mud which made keeping everything clean rather tedious. We were there over Christmas and it provided a seeet atmosphere for the holiday. There's some kitchen stuff, but not quite the right stuff. We ended up buying a glass casserole dish at the Safeway and leaving it there. Would have been nice to have a small saucepan. All in all it was fine, but if you want to do a lot of cooking, best to bring supplies. The location is hard to described. The row of houses on the street are very snug together. Once you are inside, it is lovely – but the street itself is not that nice. Again, once you are up the stairs and inside the gate, it is private – but it is not secluded and we could hear neighbors talking on both sides, almost like it was a duplex. I only say this because I wish I had known better what to expect. The town itself is great, the redwood park is just a few miles and there are many wineries nearby. Lots to do. "It was a cozy quiet getaway! " It was a cozy quiet getaway! The host responsive and easy to work with! Would stay again for sure! "Great little house in the trees"
We had a great time in Guerneville, and at this house. It was nicely decorated, clean, and provided multiple spots to relax outside. Although the neighborhood could be loud at times, it was a very peaceful spot to be, for the most part. The home was nicely appointed with the right amount of furnishings throughout. Obviously, they put a lot of thought into this home. Would return to again. We spent time on the river, which was nice and calm over Labor Day weekend. Armstrong Redwoods was a great family spot to visit. Sonoma Coast State park had beautiful views and a wonderful hike on the bluffs over the ocean. Beautiful area in general! 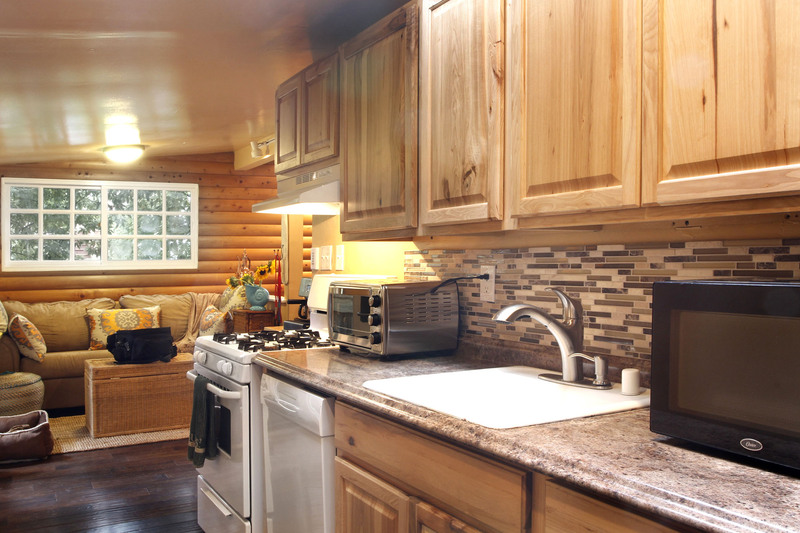 Charming and lovely one-bedroom cabin not even 5 min from town. You can't go wrong. 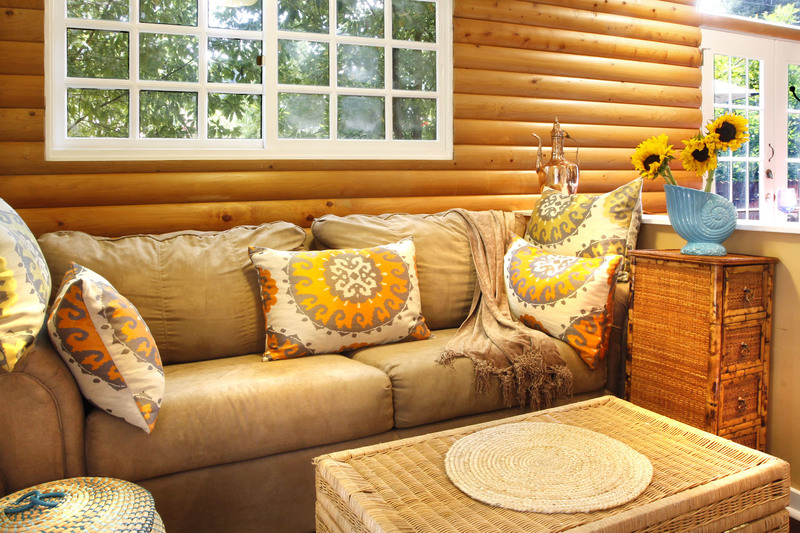 "Very cute cozy and relaxing home"
The home has everything you need for comfort, nicely decorated, clean and really loved the deck with the redwood trees and hot tub. It's perfect for a short gettaway from the hectic city life. I would definitely come back in the future. "The house is very cute and nicely updated"
The house is very cute and nicely updated. 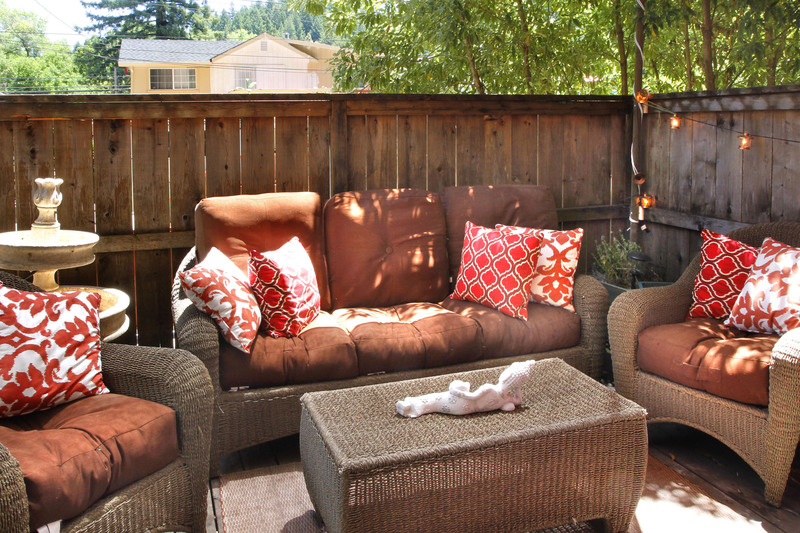 The deck space is especially quiet and good for private relaxing. The house is centrally located and gets cell service for AT&T at least (rare in that area). My only issue was that the owner failed to pay the cable/phone/internet bill so those services were unavailable for most of the stay. Likely a one time problem but it was inconvenient. Overall I would stay there again. Only good for couples, the space is small. My family of 4 (2 adults; 2 young kids) spent a fun weekend here in June. 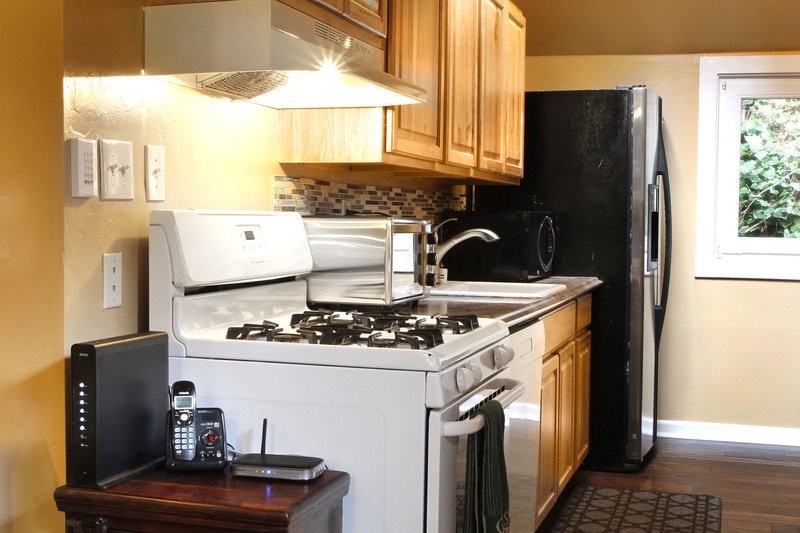 The home is very nicely furnished, with a fully stocked kitchen. Great deck area, with outdoor seating, dining table for 4, and a nice hot tub. 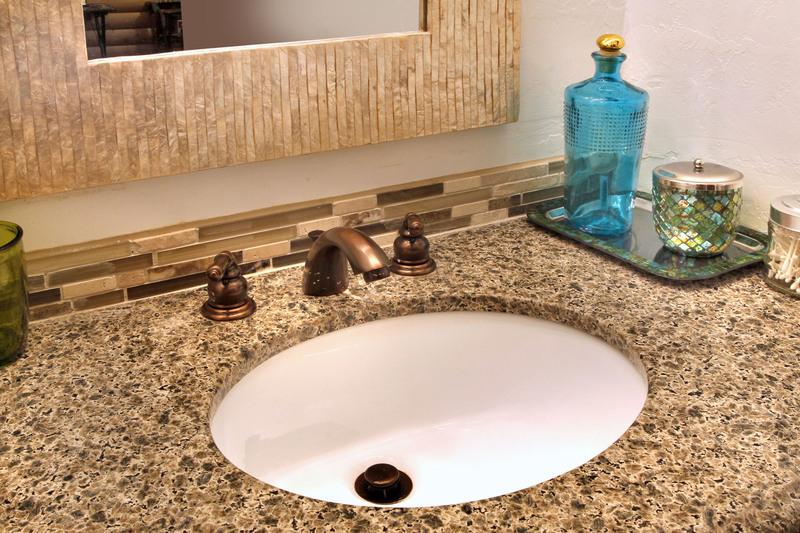 Close to town and river amenities. Perfect for a family with young kids or a couple. 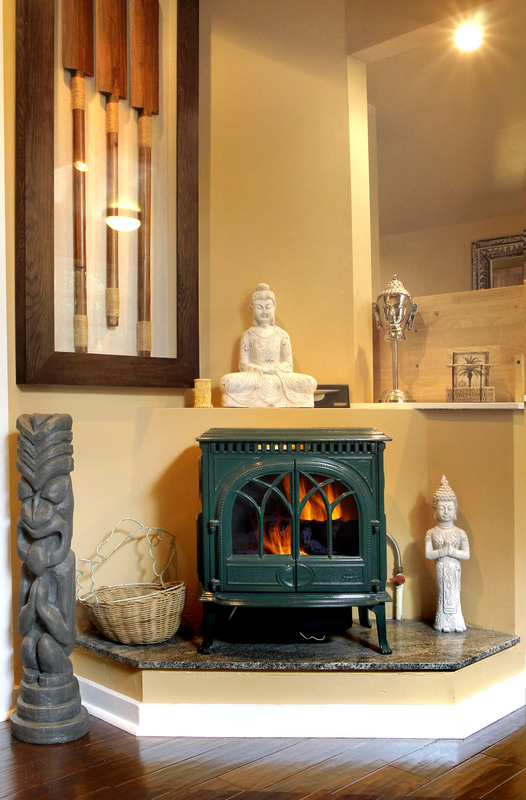 "Serendipity was a great place to relax and unwind"
Our host was a rental agency and they were very responsive and thorough. Booking online was easy and came with clear instructions. The property we rented, SERENDIPITY, was great. It was larger than I expected and so comfortable. I loved the arrangement of the apartment. The large deck with chairs and a hot tub was perfect to relax in after a long bike ride. We used the kitchen a lot and it was pretty well equipped. "Had a wonderful stay at Serendipity"
Had a wonderful stay at Serendipity. 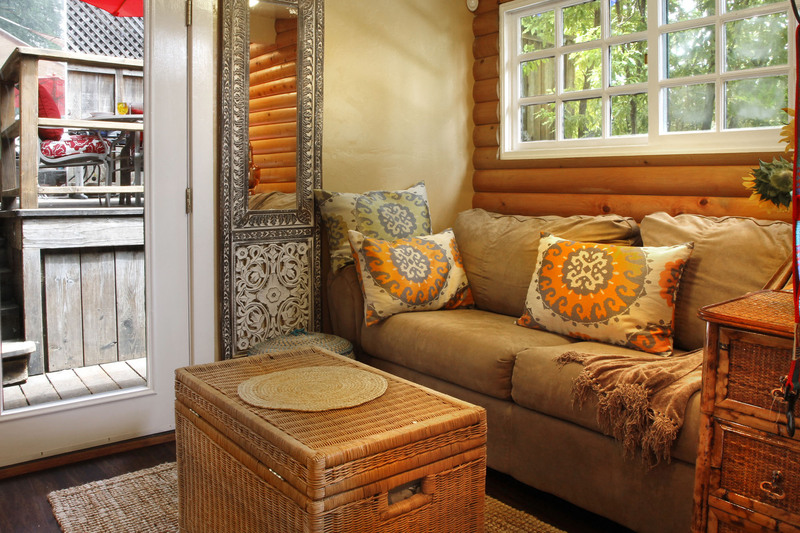 The decor was lovely and comfortable in this cozy cottage oasis. 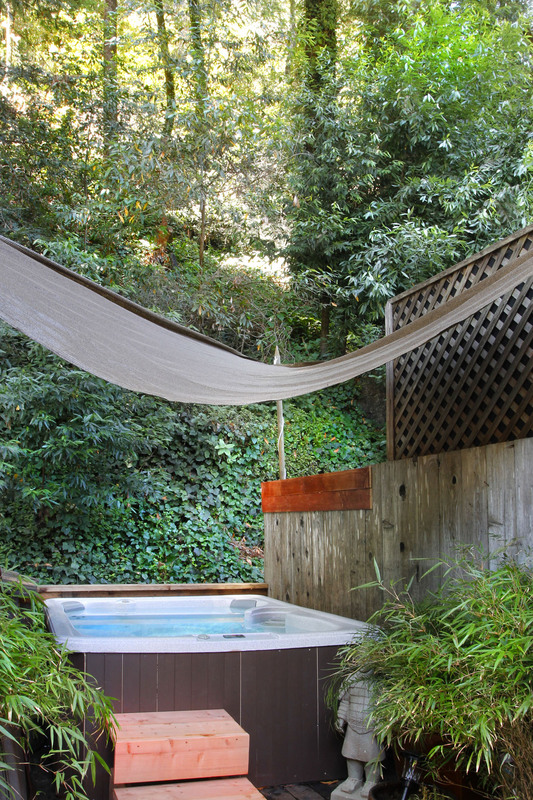 The deck is peacefully nestled among glorious Redwoods and the hot tub was ready to use upon arrival. The management staff were friendly and accommodating. We enjoyed our stay at Serendipity. The information we received from the management company was clear and helpful and we had no trouble finding or accessing the property. 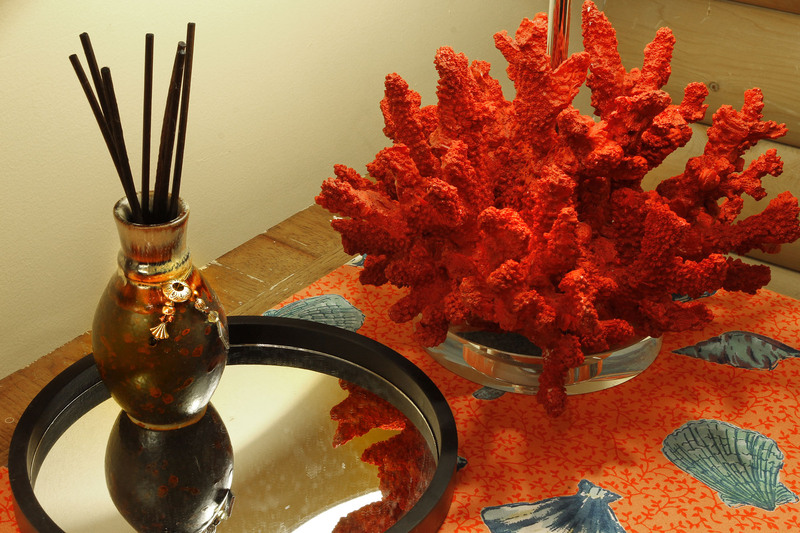 The décor is nice and as depicted in the photos. 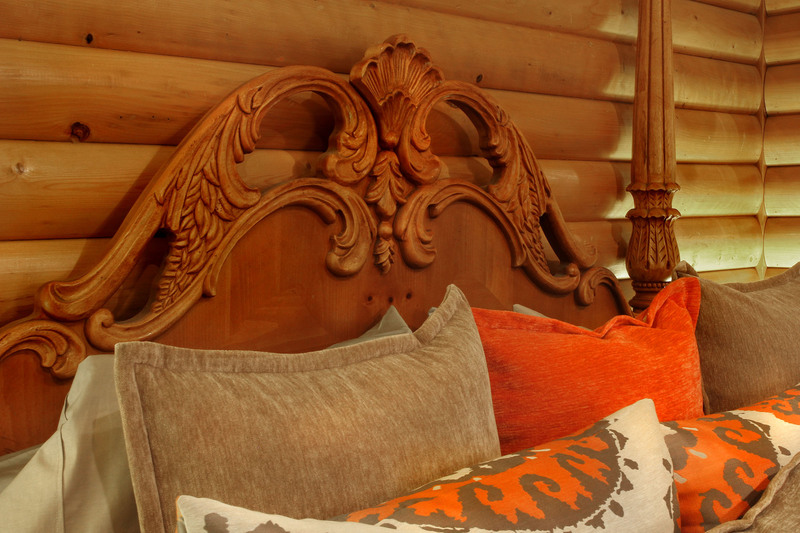 They make the most of the space in the house with cozy furnishings in exactly the right spots. The house was a perfect size for my husband and me, but in my opinion, would have been too small to share with another couple, although fine for one couple with kids. 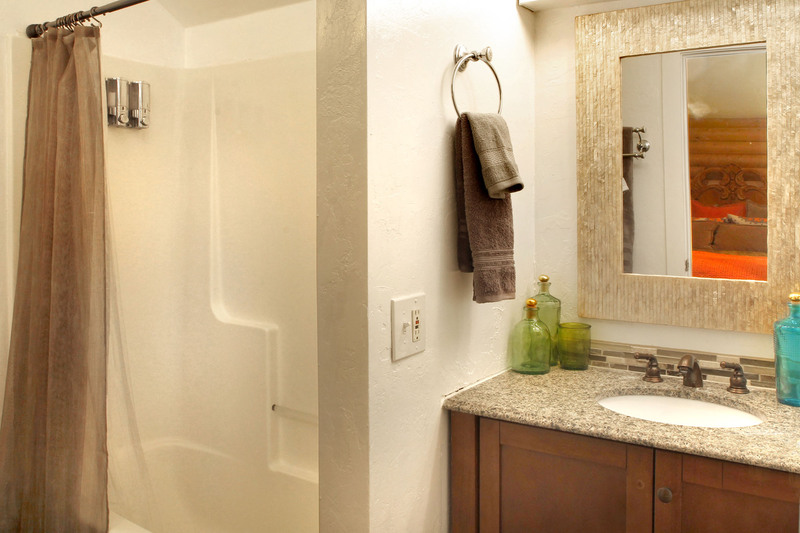 The bathroom is off the bedroom and quite small, which would have been awkward with another couple. The outdoor space was nice. It is difficult to appreciate how tucked into the hill and trees the house is until you get there, but it really is and we called it our treehouse. There was record heat when we were there, and no air conditioning, so it was a bit warm at times, especially since most windows don't have screens and couldn't be left open. They do provide a fan/portable a/c unit that helped keep us cool at night. Guerneville is a quaint town, but there isn't much "there" there...so we visited other area towns for most of our dining and entertainment (when we weren't visiting wineries for entertainment). We did enjoy lunch at Boon Eat + Drink and a some beer on the river facing outdoor deck at Stumptown Brewery. We visited and took at short hike at the Armstrong Redwoods, which was about 10 minutes away and very much enjoyed that. 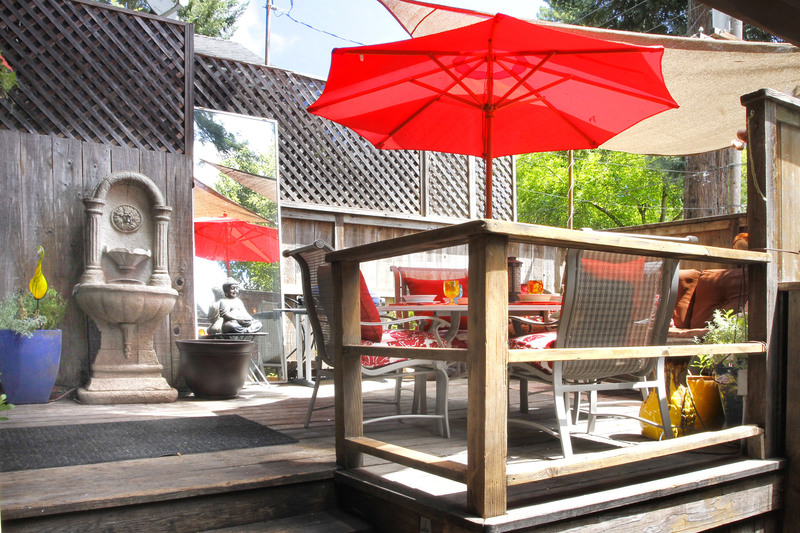 Overall, if the Guerneville location works for your trip, I'd recommend Serendipity. "Disappointing for so many reasons"
I am an easy-to-please and seasoned traveler, and this is the first negative review I have ever felt compelled to write. While the house itself is well-appointed and comfortable, the neighborhood is horrible and Russian River Getaways was shockingly unprofessional in handling the intense issues we had during our stay.1) The deck of the house is immediately adjacent to the neighbors deck, allowing for very little privacy. Sitting inside the house, we could hear our neighbors having a pleasant conversation in their backyard. We had to put up our own sheet near the hot tub to increase the privacy.2) With little to no privacy or soundproofing to speak of, the neighbors engaged in a massive tree removal project beginning at 7:45am on Saturday morning, the first day of our stay, and continued through all of Sunday starting at 9:30am. This entailed several men in trees with chainsaws hacking down large trees and putting them through a loud woodchipper, all within 50 feet of the hot tub and deck. It was not private, quiet, or even safe enough for us to be on the deck throughout the weekend. I took several photos and videos and sent them to property management.3) Russian River Getaways just stopped responding to our emails to resolve the issue in a mutually agreeable way. They said they didn't know about the project so couldn't be held responsible, and said that we should have called instead of emailed. We did call (no answer). Highly unprofessional. Given that the tree removal project looked like the beginning of a much larger landscaping project, I advise anyone thinking of staying here that they consider that the hot tub and deck is unusable when the neighbors are working in the yard. The houses are THAT CLOSE.4) Furthermore, the neighbors yards are full of trash (pictures attached) and the children shriek (making the dogs bark) at all hours, so if you are looking for a pleasant neighborhood for your vacation, do look elsewhere. One neighbor inexplicably even yelled at us randomly as we drove by.My partner and I have stayed at Dreamcatcher (another Russian River Getaways property), as well as other properties, and have always had a nice time. We will likely look to other, more customer-centered vacation rental companies in the future. 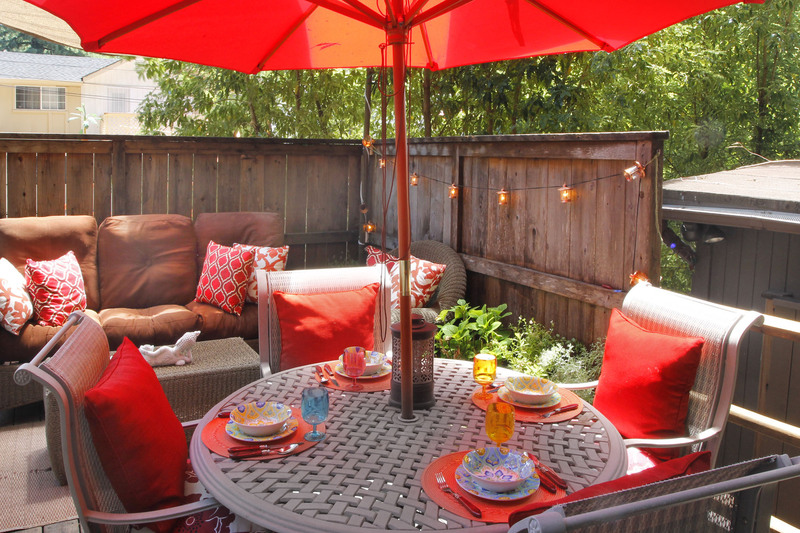 There are many properties to choose from in the Russian River area, in much quieter neighborhoods with more privacy. I gave the house two stars instead of one because the furnishings inside the house and on the deck are quite nice and comfortable. Its just too bad that the neighborhood makes the deck virtually uninhabitable. We're so sorry you did not enjoy your stay at Serendipity. While many people enjoy the colorfully diverse nature of the River, it sounds as though this area of the River was not to your liking. The house is located in a fairly dense residential neighborhood, very close to town rather than in the forest, like Dreamcatcher. The deck normally enjoys visual privacy, so the tree project was indeed regrettable. We received no voicemail or follow up call from you at the office, so we could not address your concerns in real time, however, we did take the liberty of refunding an entire night's rent for the inconveniences you noted on the day of your departure. You alluded to posting a negative review in a post stay communication to us if we did not refund you a second night, but we did not feel refunding a second night to address your concerns was appropriate. We work very hard to meet our guests' expectations and, though you may feel otherwise, we are comfortable with the lengths to which we went with those things within our control to make your stay enjoyable. "Exceeded all of our expectations"
From the standpoint of amenities, there was everything we wanted and more. We have T-Mobile mobile and had better reception than at home. Comcast internet and tv. Washer/Dryer. Expresso maker. Too much to mention. A pub across the street. Chickens in the private street.Serendipity has two decks with one of them having two large trees coming up through the deck floor. The windows are obscured by the tree leaves. There is a parking enclosure under the cottage. 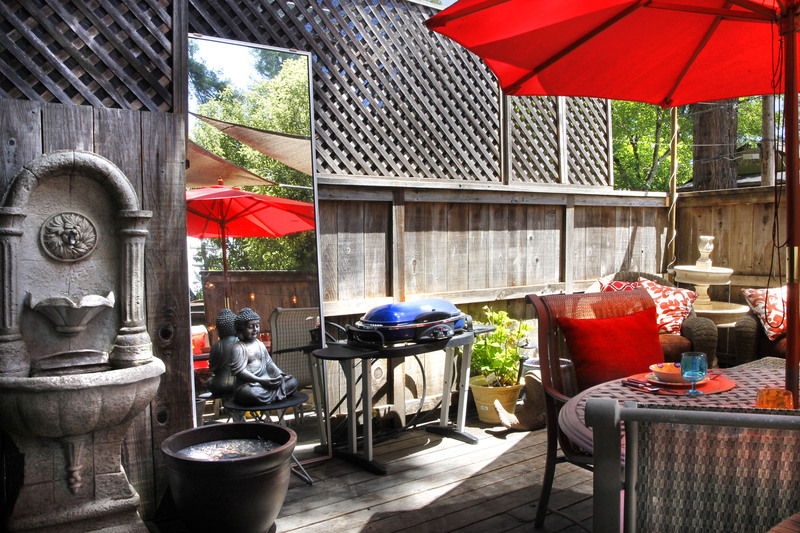 Guerneville is a great base to enjoy the Russian River area and beyond. There are wonderful restaurants and a Safeway food store. Beautiful countryside. Many outdoor activities.